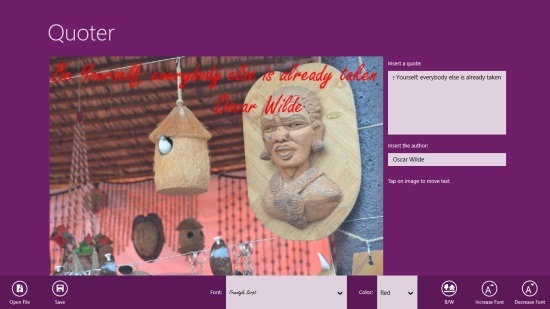 Quoter is a free Windows 8 Postcard Making App. It can be used to make postcards from your favorite photos. You can also add quotes to the postcards you create using this app. The app has a number of options available to add effects to the quotes. Options like changing the color of the quotes, changing their font size, style, and also the location of the quotes are available here. You can also save these postcards in JPEG format. Share them directly with others using the Share Charm of Windows. Quoter is available in the Entertainment category of the Windows Store. Choose your image or photo from your local storage location. You can also use photos directly from your Skydrive account. As you do this the photo will open up in the panel that is given for it. On the photo, a sample Quote and author name will be displayed. Now, you have to add your new quote and an author name to it. For that, use the panels that are available on the right side of the screen. As you write the quotes in the panel, it will appear at the same time in the photo. You can change the font size of the quote you are using here. For that, use the option available for it on the bottom right side of the app’s interface. Apart from that, you can also define font style for the quote. For that use the third option that is given in the bottom tools panel. Using the option available on its right side, you can also change its font color. The next option will allow you to turn the photo black or white. After making all the changes to the postcard you are making, you can also save it to your local storage. The postcard would be saved in JPEG format. 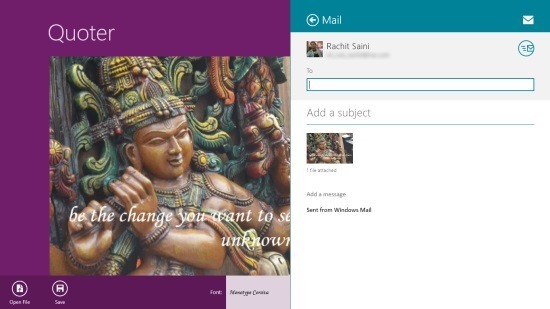 You can share the postcards you are making here by using the Windows 8 Share Charm. Also check Hallmark Go Cards and Stannp Postcards. Make postcards by including your favorite photos and quotes. They can be saved in JPEG format, anywhere on the system. Send to others just by using the Windows 8 Share Charm. You can add effects to the quotes as well as to the photos. The app is freely available. 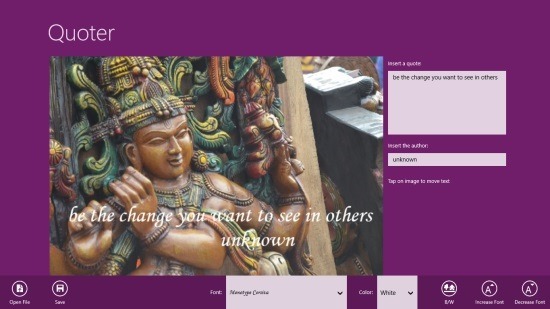 According as my experience with this Windows 8 Postcard Making app, it’s a good app to have. Working with it is very easy, and it runs quite smoothly. Give it a try for sure!